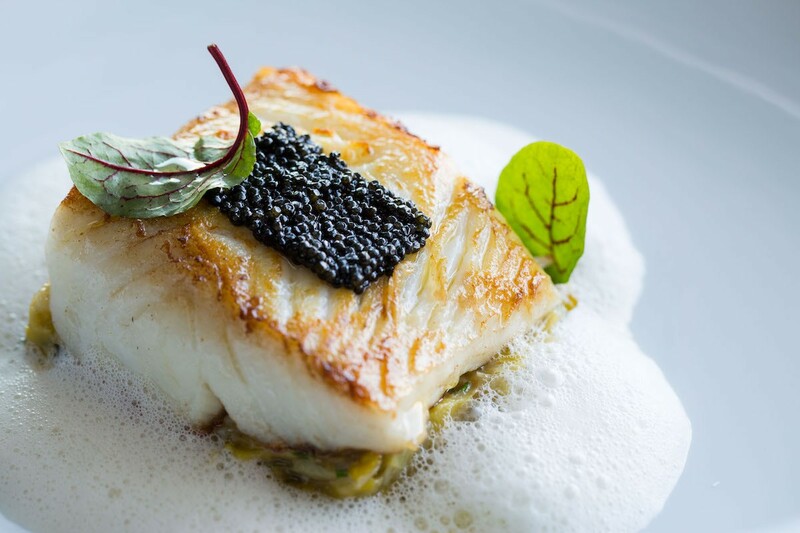 The special Christmas Eve menu at La Table includes sea bass with Ossetra caviar. Photo courtesy of La Table. As the song goes, “it’s the most wonderful time of the year.” Since 2017 hasn’t been easy on Houston, there’s more reason than ever to celebrate. This Christmas Eve, save the resolutions for January and let someone else cook the meal and take care of the cleanup, too. 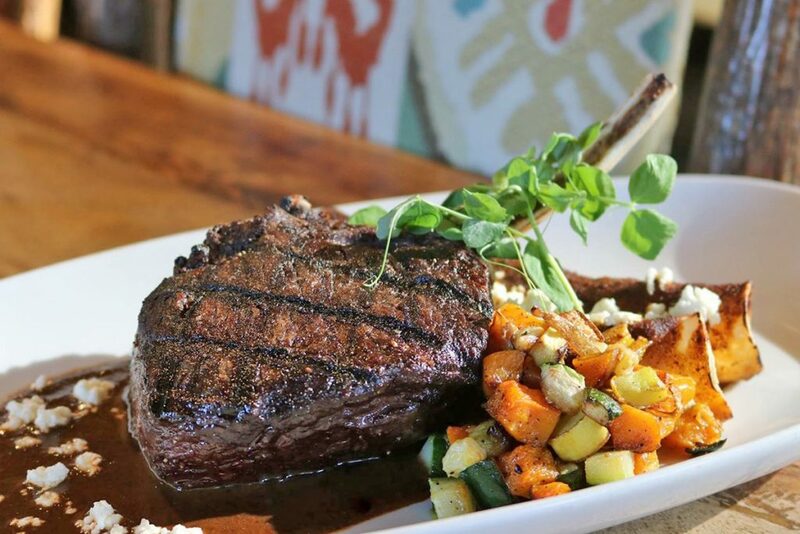 From neighborhood favorites to fancy places that serve that special, once-a-year meal, there are many excellent options throughout the Bayou City. Dining out on Christmas Day instead? Check out this list. Backstreet Cafe, 1103 South Shepherd: Christmas Eve dinner at this longstanding favorite from chef Hugo Ortega’s offers plenty of choices for diners with a wide range of dietary preferences. The three-course, pre-fixe dinner runs from 5 to 9 p.m. on Christmas Eve and includes a glass of complimentary eggnog. Traditionalists will enjoy hearty fare like braised lamb shank with creamy mushroom risotto and a red wine demi-glace reduction, while those fatigued from rich holiday foods can enjoy lighter options like the butter lettuce & radicchio salad and pan-seared grouper with roasted root vegetables. The restaurant has always been good about offering excellent vegetarian options as well. The cost is $52 per person, plus beverage, tax and gratuity. For reservations, call (713) 521-2239. Backstreet Cafe is closed Christmas Day. 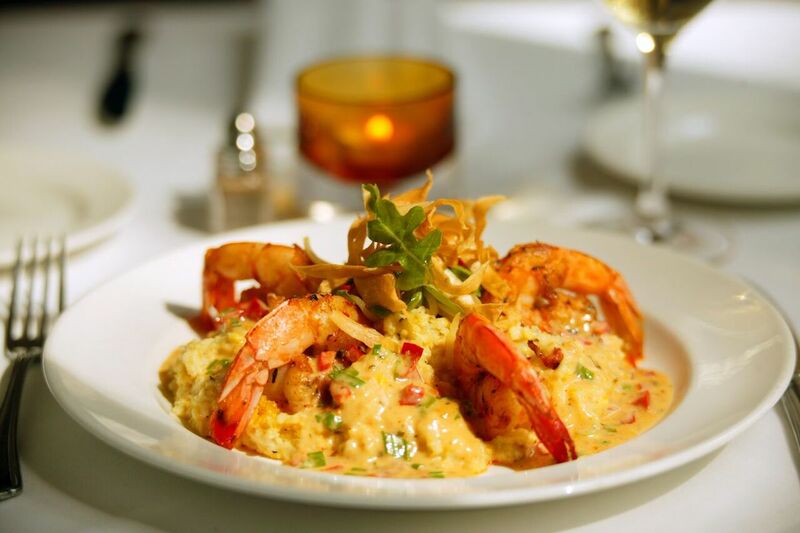 Enjoy Gulf Coast favorites like shrimp and grits during Brennan’s Christmas Eve dinner service. Photo courtesy of Brennan’s of Houston. Brennan’s of Houston, 3300 Smith Street: This Christmas Eve, the Creole restaurant with Texas flair will offer a special a la carte menu that includes restaurant favorites in addition to holiday dishes. Reservations start at 5 p.m. and end at 8:30 p.m. Call (713) 522-9711 for more information. The restaurant is closed Christmas Day and Tuesday, December 26. Lucienne, 1070 Dallas Street: Enjoy an upscale four-course Christmas Eve dinner in stylish, modern surroundings at executive chef Jose Hernandez’ French restaurant in the new Hotel Alessandra downtown. Dishes include gravlax with horseradish mustard, capers and bread, as well as oven-roasted duck served with chestnuts, potato cake and lavender sauce. Sweet treats include Fig Crepe Soufflé. The festive meal is available from 5:30 to 10 p.m. for $80 per person or $105 with a wine pairing. Reservations are recommended; call (713) 242-8555 to make one. 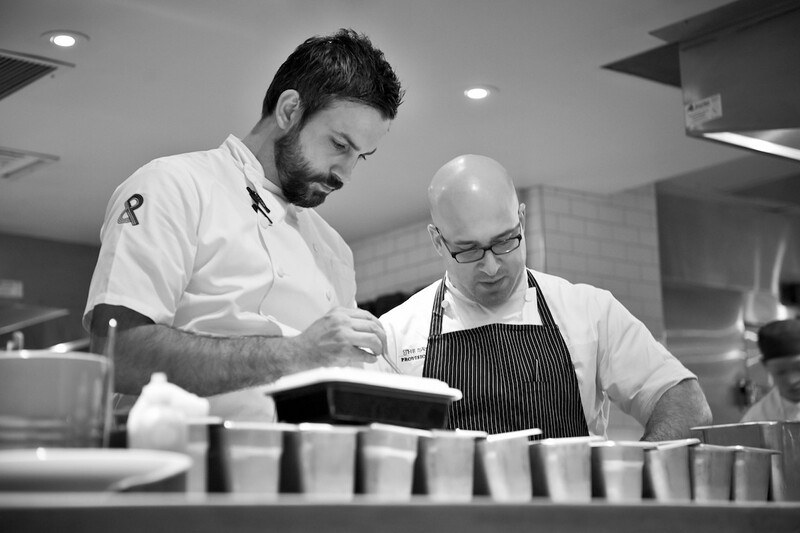 Pass chefs Seth Siegel-Gardner and Terrence Gallivan work in the kitchen. Photo by Ralph Smith Photography . The Pass and Provisions, 807 Taft: On the night before Christmas, The Pass celebrates their own special Feast of the Seven Fishes. In their version of an Italian-American tradition, The Pass is serving seven courses of seafood with the option of adding wine pairings. Cost is $125 per person or $200 with pairings, plus tax and gratuity. Purchase tickets by calling (713) 628-9020, and choose option 2 to speak to the host. Tickets are non-refundable, but are transferable. Provisions is also open on Christmas Eve for regular dinner service, and both restaurants will be closed Christmas Day. 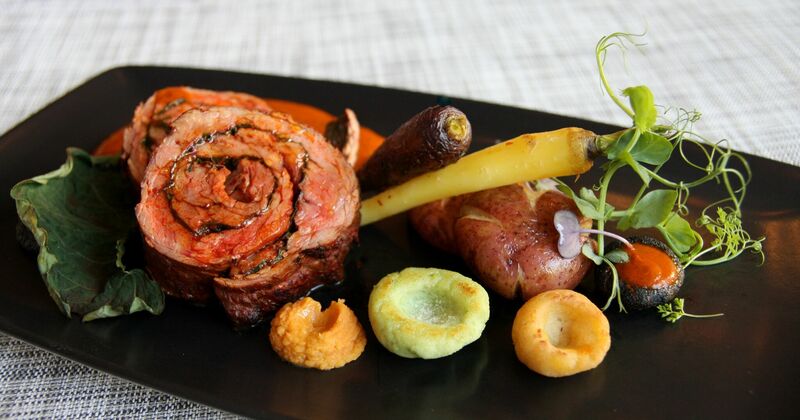 Xochi’s Barbacoa is one option guests can select from the a la carte Christmas Eve menu. Photo by Paula Murphy. Xochi, 1777 Walker: From 5 to 9 p.m., enjoy a Cena de Noche Buena (Christmas Eve dinner) with a la carte selections, seasonal selections and a complimentary ponche (Christmas punch). Music from Media Luna adds to the festive atmosphere. Added 12/18/2017, 5:55 p.m.
ARA and Axis Lounge, 2222 West Loop South: Christmas Eve dinner at the Royal Sonesta Houston hotel includes special entrees for the holiday, including Prime Rib served with Yukon mashed potatoes and glazed veggies for $32. Don’t forget to warm up before or after dinner via the apple cider station in the lobby. Etoile Cuisine et Bar, 1101-11 Uptown Park Boulevard: Christmas Eve at the upscale French restaurant will ensure a Joyeux Noël. The Christmas Eve, three-course menu includes updated favorites like roasted duck breast with polenta, butternut squash and morel mushroom sauce and Filet de Saint Pierre, a traditional white fish with cauliflower mousse and coconut-vanilla emulsion. Finish the meal with the restaurant’s version of bûches de Noël: a raspberry and chocolate Christmas log with raspberry gel and pistachio ice cream. The cost is $65 and reservations are available via OpenTable. La Table, 1800 Post Oak Blvd #6110: If you’re looking for an elevated dining experience this Christmas Eve, La Table won’t disappoint. The a la carte menu includes dishes like wild-caught striped bass served with asparagus and topped with Black Royal Siberian Ossetra Caviar and Champagne sauce, and signature heritage chicken for two served with mushrooms, winter vegetables and potato purée. Finish with the festive, traditional buche de noel au chocolate for dessert. La Table is donating $3 per guest to Hurricane Harvey recovery through the Hospitality for Houston relief initiative. 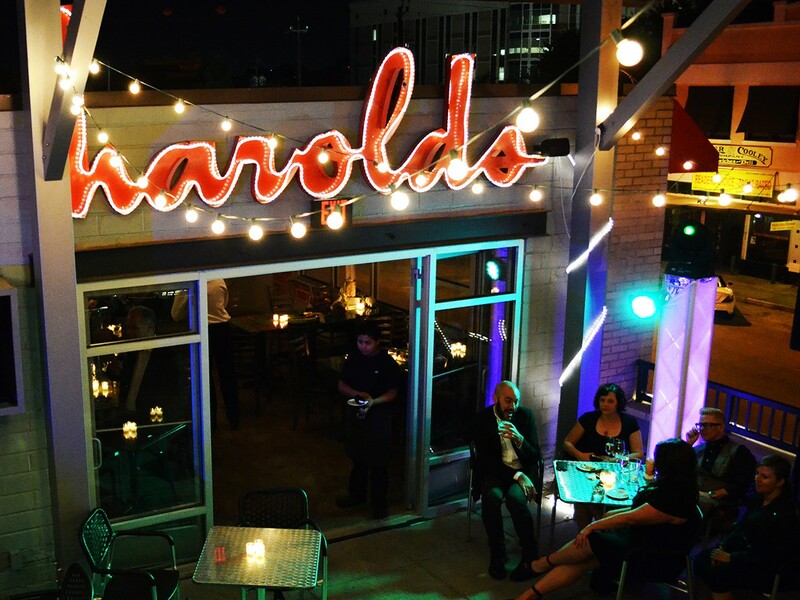 Harold’s Restaurant & Tap Room, 350 West 19th: On Christmas Eve from 10 a.m. to 3 p.m., chef Antoine Ware’s hearty a la carte brunch menu features decadent Bananas Foster French Toast, the Big Nasty Biscuit with buttermilk fried chicken and cheddar cheese-sausage gravy or the Grits & Grillades, a grilled pork cutlet in grillade sauce with pimento cheese, stone-ground grits and a fried egg on top. View the full brunch menu then make reservations either by calling (713) 360-6204 or via the website. Added 12/22/2017, 6:30 a.m.
Elk Chop with Roasted Root Vegetables at Rainbow Lodge. Photo courtesy of Rainbow Lodge. Rainbow Lodge, 2011 Ella: With the cozy log cabin adorned in festive decorations, diners might imagine there are reindeer just outside. With the roaring fireplaces and four private dining rooms, Rainbow Lodge is an ideal choice for celebrating “the most wonderful time of the year.” It is open for brunch and dinner on Christmas Eve and closed Christmas Day. While visiting, don’t forget to pick up a few of the terrific holiday mugs filled with Godiva cocoa and chocolate that we recently featured in our holiday gift guide. These are fun for “kids of all ages” and wrapped, tied with a ribbon and ready to go. The cost is $20 each. Call (713) 861-8666 to reserve or for more information. Added 12/22/2017, 6:37 a.m.
Hugo’s, 1600 Westheimer: Enjoy a Buffet de Noche Buena on Christmas Eve, a big selection of Mexican regional favorites at chef Hugo Ortega’s flagship restaurant. There’s also live music by Viento. Cost is $45 per adult and $15 per child, plus beverages, tax and gratuity. Call (713) 524-7744 for reservations. Lucille’s, 5512 La Branch: Chef Chris and Ben Williams’ Southern restaurant is serving Sunday brunch on Christmas Eve and there will also be live music to entertain guests. Brunch runs from 10 a.m. to 3 p.m. and the restaurant is closed on Christmas Day. Added 12/22/17, 7:45 a.m.
Underbelly is doing its interpretation of a Christmas Eve meal with the Griswolds of National Lampoon fame. Illustration by Matthew Tabor. 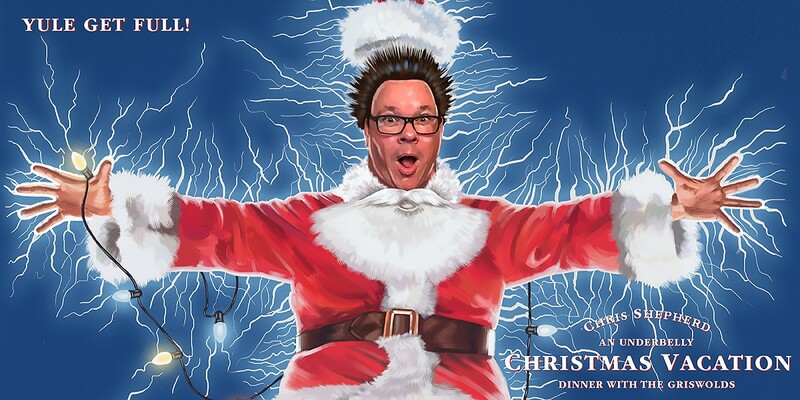 Underbelly, 1100 Westheimer: Fans of National Lampoon’s Christmas Vacation will appreciate the humor of the annual Christmas Eve theme dinner at Underbelly. It’s billed as “a holiday meal that’s fit for the newest member of the Jelly of the Month club.” The three courses will include turkey, egg nog and—of course—a jello mold. Cost is $75 for adults and $35 for kids. There are two seatings available at 1 p.m. and 5 p.m. Alcohol is available for purchase onsite. This is also the last Christmas Eve to enjoy Underbelly in its current form. For more information and to buy tickets, head to the restaurant website. As of our last update, only 20 seats remained for the 1 p.m. seating. Updated 12/22/2017, 7:47 a.m.
D’Amico’s Italian Market Café, 5510 Morningside: Whether you’re last minute shopping for housemade giugiuleni—the famed Italian seed cookies—or just looking to enjoy Northern Italian and Southern Sicilian cuisine surrounded by Italian Christmas items, D’Amico’s is open for Christmas Eve lunch and dinner. At the end of the meal, take home a bottle of Italian wine or pick up an imported Pannetone to channel a true Italian Christmas tradition. Note that the restaurant will be closed Christmas day. 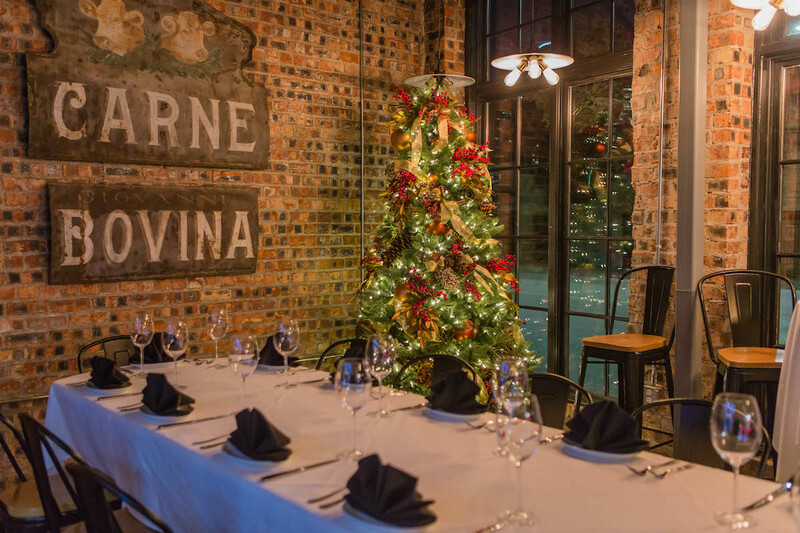 Ouisie’s Table, 3939 San Felipe: December 24 means a Christmas Eve Feast at this River Oaks classic, serving an a la carte menu including regular Southern-style favorites and holiday specials. The Christmas Eve Feast will be available from 5 to 10 p.m., with reservations encouraged. The restaurant is closed Christmas Day. For information and reservations, visit the restaurant website or call (713) 528-2264. 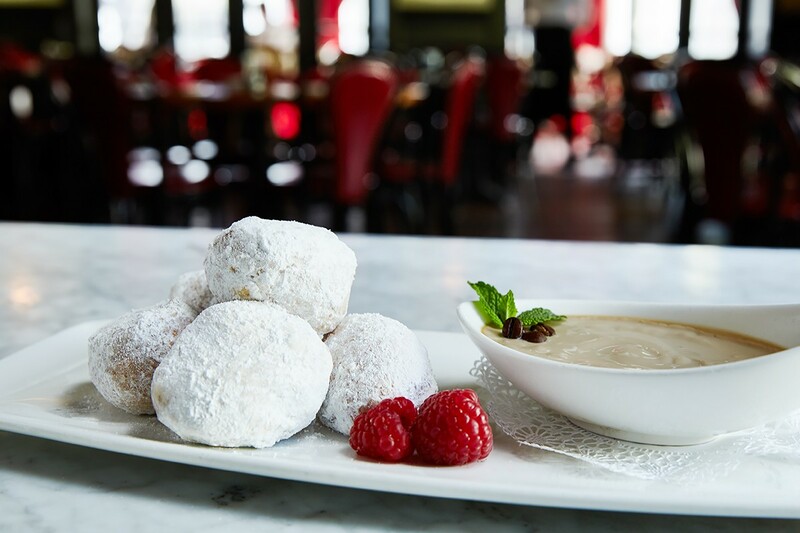 Beignets from the Toulouse brunch menu. Photo courtesy of Toulouse. Toulouse, 4444 Westheimer: This modern French restaurant located in the courtyard of the River Oaks District, will be open regular hours on Christmas Eve. Brunch is from 9 a.m. to 3:30 p.m. and dinner is from 3:30 to 10 p.m. The special dinner menu includes Lobster Tail Tournedos, or lobster tail wrapped in bacon served with a devil sauce green peas and goat cheese ravioli, and Australian rack of lamb served with grand venuer sauce, sweet potato puree, crispy lardon and wild mushrooms. Finish dinner with Praline Chocolate Cake and ice cream. Buy a $100 gift card while there and get a free $20 card. 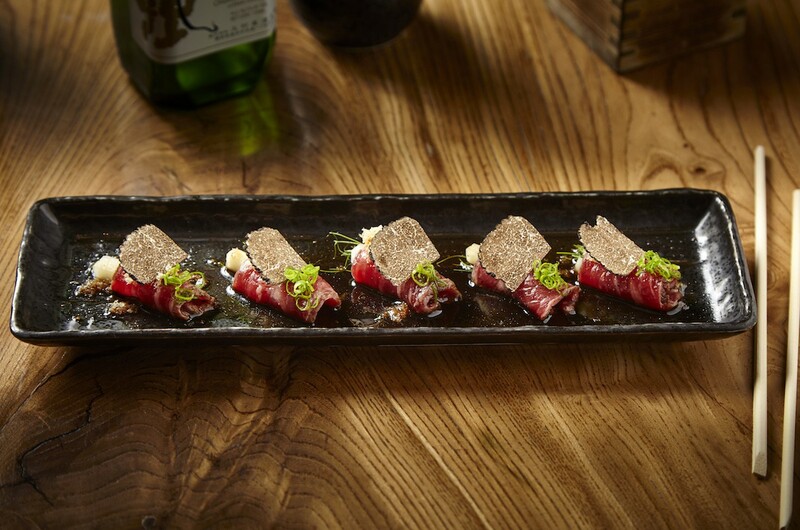 Added 12/22/2017, 8:02 a.m.
Opt for Roka Akor’s special five-course menu on Christmas Eve, or order dishes like this Prime Beef Tataki from the a la carte menu. Photo courtesy of Roka Akor. Roka Akor, 2929 Weslayan: Japanese steakhouse and sushi concept Roka Akor begins its first holiday season in Houston with a five-course tasting menu on Christmas Eve. For $95 per person, the meal features favorites like Grilled Pork Belly with Tarragon Miso to Japanese Mushroom Rice Hot Pot with shaved black truffle and bone marrow with spicy garlic soy. Kiran’s, 2925 Richmond Ave: Relax before last-minute gift-wrapping Christmas Eve with an afternoon tea or dinner on Sunday, December 24. Guests have the option to choose between British or Indian specialties for the afternoon tea ceremony, which includes traditional warm scones or savory finger foods like tandoor-smoked salmon. Whether you opt for brewed black tea or boiled masala chai with cream and brown sugar, it’s an excellent way to wind down before the busy festivities on the 25. B&B Butchers offers a very merry Christmas Eve dinner for meat lovers, in addition to Christmas carolers from 8 to 9 p.m. Photo by Bonner Rhoden. B&B Butchers, 1814 Washington Avenue: The upscale steakhouse will be open on Christmas Eve for lunch and dinner. Guests can look forward to dry-aged favorites, like the Texas Wagyu and Beef Wellington, as the regular dinner menu will be available. Enjoy a late evening treat from 8 to 9 p.m, when Christmas carolers perform at the restaurant. Note that the restaurant will be closed on Christmas Day. FM Kitchen & Bar, 1112 Shepherd: Christmas Eve: Chef Ryan Hildebrand will offer a special Christmas Eve brunch menu all day beginning at 11 a.m. 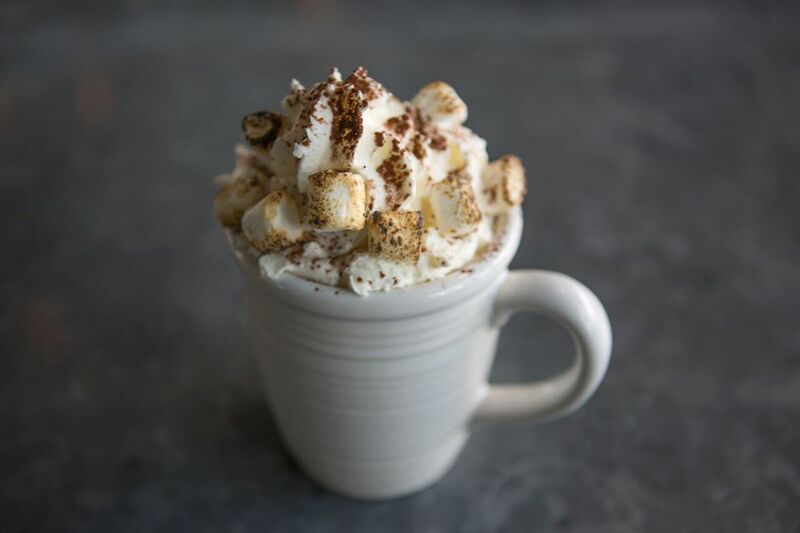 Features include Steak and Ale Soup, Egg Nog Pancakes, Christmas Pork Belly & Eggs, Bagel and Lox, FM Wellington and a Snickerdoodle Shake. Bistro Provence, 13616 Memorial Drive: On Sunday, December 24, Bistro Provence offers a three-course holiday menu created to give diners a taste of the season from one of France’s most picturesque regions. After a first course of foie gras or housemade smoked salmon, enjoy a choice of mains like seared duck breast à l’orange, Beef Wellington, or wild red snapper in addition to classic holiday desserts. The cost is $65 per person—plus tax and gratuity—with open seating from 6 to 6:30 p.m. and from 8 to 8:30 p.m. A $30 deposit via PayPal is required to confirm the reservation. Note that the regular menu will not be available Christmas Eve, and the restaurant will be closed Christmas day. For reservations, call (713) 827-8008 or send an email. 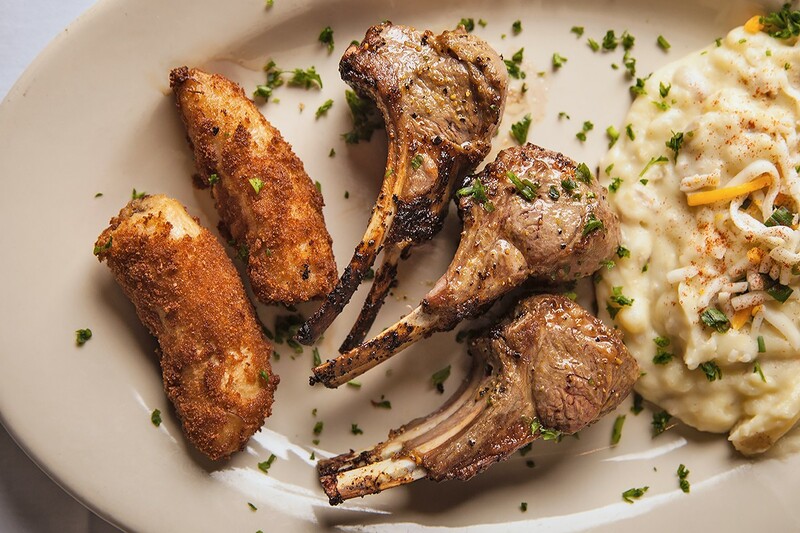 Lamb chops at Chama Gaucha. Photo by Chris Brown. Chama Gaúcha Brazilian Steakhouse, 5865 Westheimer: The Brazilian steakhouse is offering a variety of flame-roasted meats, side dishes and an extensive salad bar on Christmas Eve from noon to 9.pm. The traditional rodizio menu is $52.50 all day. Festive, live music will put guests in the holiday mood. The restaurant will be closed on Christmas Day. 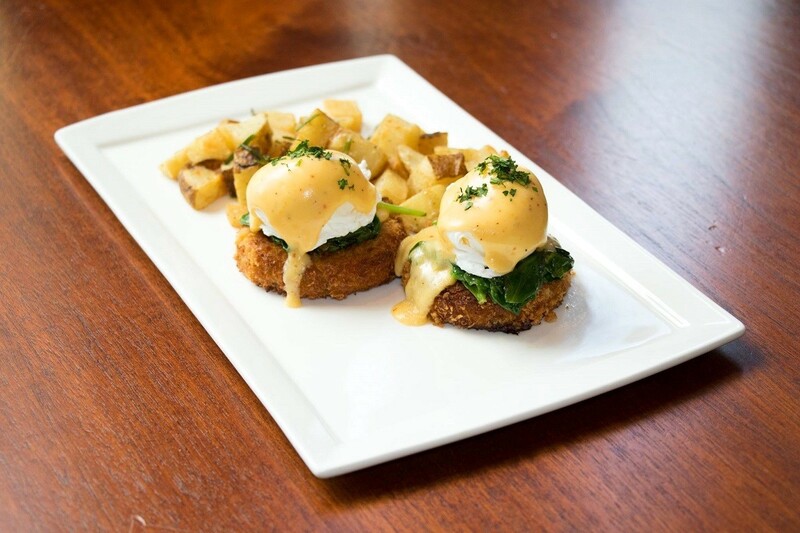 Added 12/22/2017, 7:38 a.m.
Radio Milano’s Christmas Eve brunch menu includes Crab Cakes Benedict, above. Photo credit: Radio Milano . Radio Milano, 800 Sorella Court: Radio Milano is offering three-course, prix fixe brunch menus for Christmas Eve. On December 24, enjoy Chicken Wings and Waffles, Crab Cakes Benedict and Dulce de Leche Crepes from 10 a.m. to 3 p.m. for $30 per adult and $15 per child. 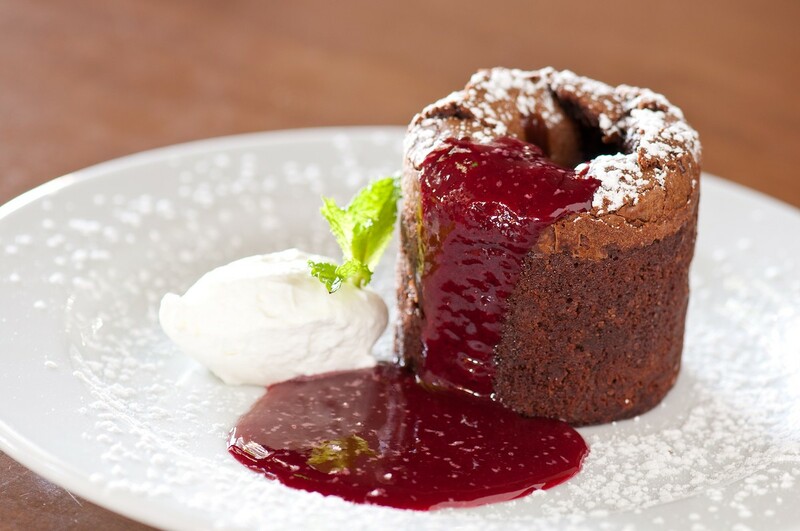 End the Christmas Eve meal at CRU with a molten chocolate lava cake, pictured above. Photo courtesy of CRU Food and Wine Bar. CRU Food and Wine Bar, 2800 Kirby and 9595 Six Pines, The Woodlands: Both locations of CRU Wine Bar are offering a special three-course Christmas Eve menu for $40 per person on December 24 from noon to 10 p.m. Enjoy appetizers like Pumpkin Mascarpone Ravioli and lobster bisque, followed by seared sea scallops or filet mignon with truffle potato gratin. Dessert options include a rice molten chocolate lava cake and egg nog crème brûlée. Note that the regular a la carte menu will also be available. Sweet Paris Crêperie & Café, 2420 Rice Boulevard and 797 Sorella Court: If you’re stuck picking up last minute gifts at CityCentre or Rice Village on Christmas Eve, consider channeling your holiday shopping feelings into devouring the December Crêpe of the Month: The Grinch. Prepared in a Grinch-inspired green batter, the sweet crêpe is filled with crème brûlée, red strawberries, green M&M’s and dulce de leche. The CityCentre location is open from 8 a.m. to 6 p.m., and the Rice Village location is open from 8 a.m. to 5 p.m. Both locations are closed on Christmas Day.